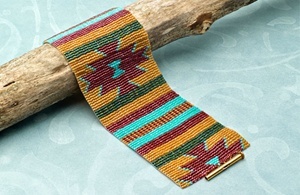 Serape bracelet by Lesha Mcphearson - Inspired by the traditional Mexican shawl, this loomwork bracelet is both bold and beautiful. 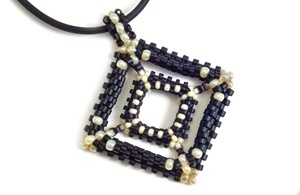 Double diamond delights by Phyllis Dintenfass - Make a pendant of nested peyote diamonds inspired by the Coptic crosses of Ethiopia. 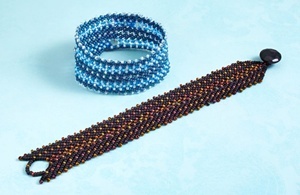 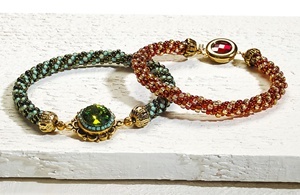 Stacked St Petersburg bracelet by Ruth Vickery - Inspired by the beauty of St. Petersburg chain, this bracelet features strips of beadwork you can join two different ways. 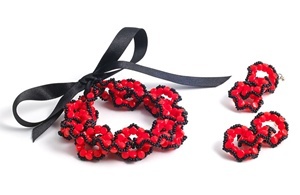 Flamenco Pellets bangle by Kerrie Slade - Stitch an easy bracelet and earrings reminiscent of a flamenco dancer's dress using linked rings of Pellet beads and contrasting seed beads. 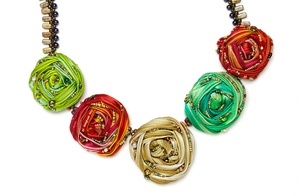 Shibori roses by Jane Danley Cruz - Fold shibori ribbon into rosettes you can embellish with beads and assemble into a necklace, pin, or earrings. 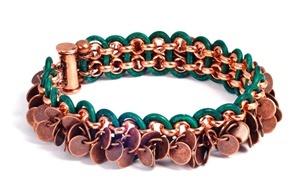 Plain chain no more by Becky Guzman, Jane Danley Cruz - Make a bracelet with two kinds of chain and round leather cord while getting the inside scoop on working with these two materials. 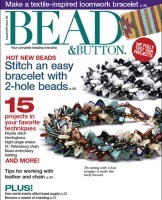 Totally tubular triangle beads by Diane Fitzgerald - Take netting to the next level with two-hole triangle beads in an edgy rope-style bracelet. 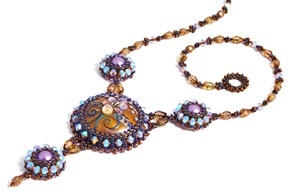 Bella bijoux by Jimmie Boatright - Transform the Bead&Button 20th anniversary bead into an elegant necklace with bead embroidery and a trio of peyote-bezeled pearls. 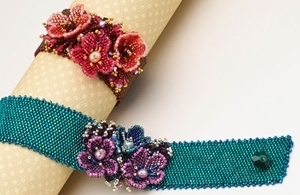 Floral fireworks bracelet by Roxi Rogers - Add brick stitch flowers and branched fringe to the center of a peyote band with a cut-out clasp. 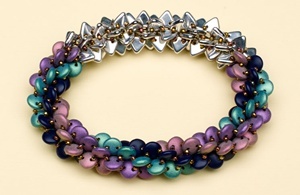 Corkscrew bangle by Marla Salezze - Work a twist into a tubular brick stitch bracelet, and then add an embroidered focal. 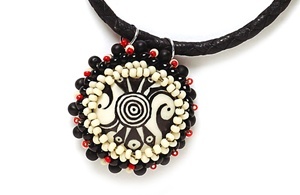 Herringbone bezel pendant By Jane Danley Cruz - Stitch this quick frame for a favorite focal bead or cabochon using an easy flat herringbone technique. 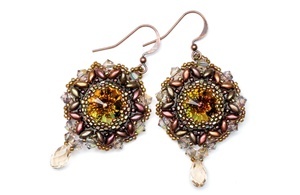 Rivoli rendezvous By Svetlana Chernitsky - Crystal rivolis shine when surrounded by SuperDuos and bicones in these earrings and coordinating pendant. 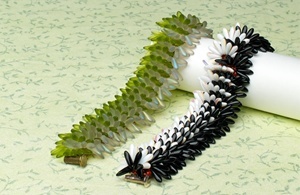 Funky skunk By Virginia Blakelock - Work up a unique bracelet that's fun to wear using two colors of daggers and seed beads.